CWB Chicago: THREE SUSPECTS DETAINED: Has Local Burglary Crew Met Its Waterloo? THREE SUSPECTS DETAINED: Has Local Burglary Crew Met Its Waterloo? An eagle-eyed neighbor may have helped police catch up with a prolific burglary crew on Wednesday. Detectives are now working to determine if the suspects are responsible for any of the numerous break-ins reported in Boystown and nearby areas in recent weeks. Police responded to the 3000 block of Waterloo Court at 12:10PM after the witness reported seeing someone apparently casing a nearby condo. Officers quickly rounded up three men, one of whom unconvincingly claimed to be "looking for an apartment." That ruse failed miserably when signs of an attempted burglary were discovered at the Waterloo address. Later in the evening, as the three men cooled their heels in a police lock-up, another break-in was discovered in an apartment building on Barry Avenue, about 50 yards from the Waterloo address. Area North detectives are now looking into the possibility that the three men may have pulled off a series of burglaries, including sprees that targeted residents along Broadway and on Sheffield this month. 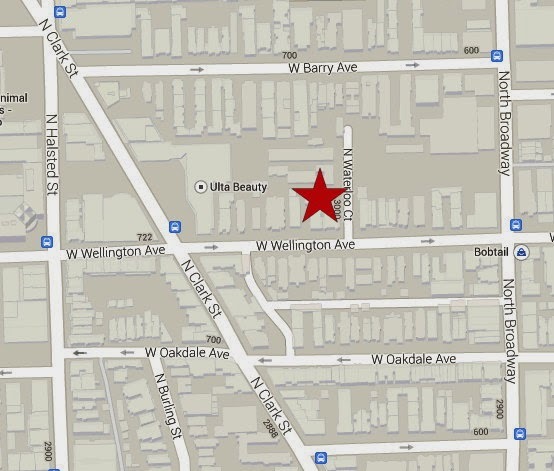 A condo unit in the same Waterloo complex was burglarized this January. Almost exactly 24 hours before the Waterloo 911 call came in, a resident is believed to have interrupted a burglary in progress on Sheffield Avenue, just north of Belmont. A witness told police that they saw three men drive away from the Sheffield and Belmont area at a high rate of speed. The men detained on Wednesday were traveling in a car that is registered in south suburban Chicago Heights, but its make and model are different from the vehicle seen on Sheffield.